Change in education is inevitable and some say that education is in a ‘constant state of flux' (Neil & Morgan, 2003). With the introduction of the Australian Curriculum: the Arts, arts teachers, including dance, drama, media arts, music and visual arts, see yet another change. However, this time it is not at the state/territory level, for example, in Queensland in 2002 the 1-10 Arts curriculum was implemented and then in 2007 The Arts: Essential Learnings; in Tasmania. This change is at the national level with the implementation of the Australian Curriculum: The Arts. This paper explores how teachers of the arts are dealing with another curriculum change, but this time at the national level. This paper will suggest that teachers need to look inward first by reflecting on their own personal curriculum journey. 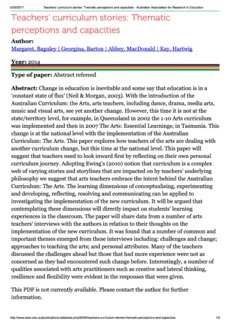 Adopting Ewing's (2010) notion that curriculum is a complex web of varying stories and storylines that are impacted on by teachers' underlying philosophy we suggest that arts teachers embrace the intent behind the Australian Curriculum: The Arts. The learning dimensions of conceptualising, experimenting and developing, reflecting, resolving and communicating can be applied to investigating the implementation of the new curriculum. It will be argued that contemplating these dimensions will directly impact on students' learning experiences in the classroom. The paper will share data from a number of arts teachers' interviews with the authors in relation to their thoughts on the implementation of the new curriculum. It was found that a number of common and important themes emerged from these interviews including: challenges and change; approaches to teaching the arts; and personal attributes. Many of the teachers discussed the challenges ahead but those that had more experience were not as concerned as they had encountered such change before. Interestingly, a number of qualities associated with arts practitioners such as creative and lateral thinking, resilience and flexibility were evident in the responses that were given.